This cozy rural villa for 8 provides authentic experience of the Mediterranean village as it once was. Restored using authentic materials, it has a traditional feel of belonging to a place. The villa offers all comfort one might look for in a contemporary home in harmony with tradition and nature. There is a private parking lot. 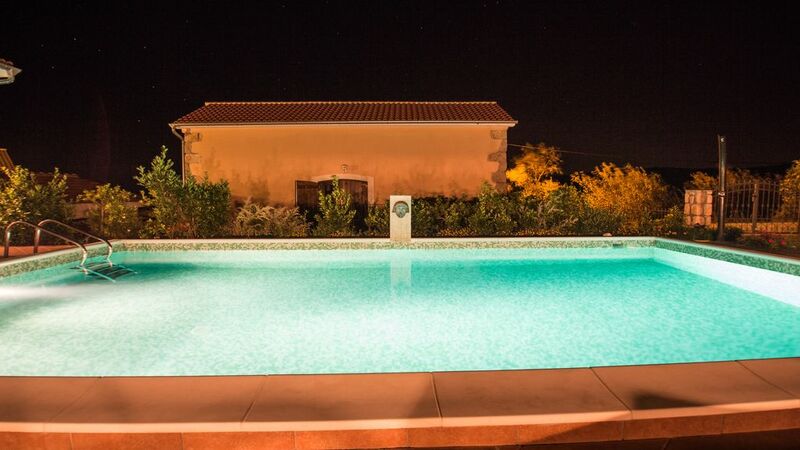 There are two villas (villa Xenia and villa Liberta) with a pool. Each villa has a full privacy and private yard. There is a pool, comfortable pool area (with sun chairs and sun umbrellas) and large garden (3000 sqm meadow, planted with fig trees and other native plants). -kitchen, dining area, living room (with a sofa for one additional person). There is also a nice large terrace with amazing seaview. Super nice stay. Idyllic location. Very calm. We booked Villa Xenia and Villa Liberta for 3 nights and it was a great stay. We were 5 adults and 2 children, and were very pleased. The houses were clean and comfortable and the pool area was just perfect. The surroundings were very beautiful as well. It is a short drive away from a big town were you can get all your shopping done. All in all, an outstanding experience. Wer Ruhe sucht und die Berge liebt ist da genau richtig. Der Pool ist der Hammer. Alles Top.